The threat is great! Professor Skarov is implementing his Machiavellian plans. Fortunately, the members of the Liberty Patrol are there. Four in number, protectors of the innocents and ardent defenders of Liberty, they will try to thwart the evil projects of the odious character! 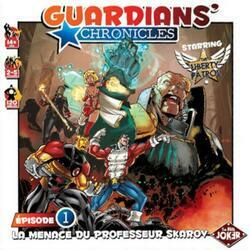 In Guardians' Chronicles, a player embodies Professor Skarov and tries to realize his evil designs. The other players embody the members of the Liberty Patrol and join forces to fight the megalomania and destructive action of this evil scientist. The heroes will have to infiltrate a reputedly impregnable base and face the multiple enemies and sneaky traps placed on their way. Skarov, at the head of an army of robots and mercenaries-ninjas, will he be able to measure the concerted strategy and powerful powers of heroes determined to negate his desires for conquest? Will heroes demonstrate the ingenuity and team spirit needed to overcome the various obstacles in their path and defeat their sworn enemy?